With the stress of school, my number one addiction is the post workout endorphin rush. I’m pretty sure if I didn’t sweat it out for at least 10 minutes every day I would go crazy. In the mean time leading up to Monday I’ve been all over Amanda’s insta feed to find workouts to ease me into the sweet torture I know is starting soon. 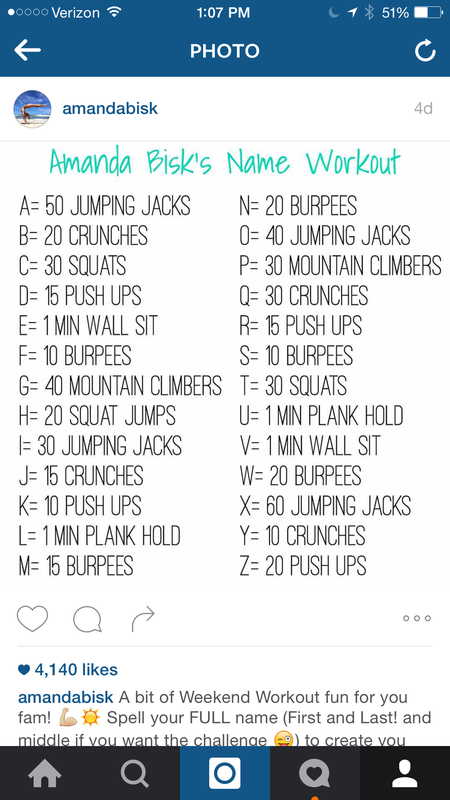 One awesome workout I found on her page was this Name Workout. So my full name has lots of Ms and Ns in it…I’ve never been more mad at my parents until I was doing 40 full burpees back to back. I wanted to share it here, so you can tackle your first name, middle, last, married, and sweat it out while celebrating yourself! Come on, who doesn’t love a workout based YOU!!! If you’d like to follow my #FBFM journey or join in the fun, I’m going to chronicle it all on my instagram. I’d love you hear how you are sweating it out this Wednesday. Sorry for going MIA Monday, I needed a bit of a break…and I was neck deep in learning team meetings, managerial statistics homework, and catching up with some classmates. Today I want to ramble on about one of my favorite things (that will hopefully become a regular part of this blog), boutique workouts. My workouts are pretty varied, and I belong to Equinox. I love my EQ workouts and classes, but sometimes I want to get dressed in my best Luon and head some place new, and that’s where boutique workouts come in. A week ago I had a late start to class on a Thursday and decided to try out a spot I frequently see on Hannah Bronfman’s snapchat. By the way if you aren’t frequenting her instagram or www.HBfit.com, you are missing out on some awesome wellness inspo! I’ve been intrigued by 305 Fitness for a while now. As few may know I’m a frustrated dancer. I’m not amazing, but I have dreams of breaking it down Step Up style. So I put on my best day glow VS Sports pieces and headed down to the village for a 7am partay! First off I knew I was in for a good time when DJ April Fresh stepped into the DJ booth. Yes, you heard that right, there is a live DJ! My teacher for the morning was Denese Butler. There were black lights, strobes, I’m pretty sure glitter fell from the ceiling (or maybe I imagined that). It was like going to the hottest club, I was having so much fun I didn’t notice I was working out. I was dripping in sweat, smiling ear to ear, and riding an insane cloud of endorphins. I took a 305 arms class, which had a concentrated arm segment. But I legit couldn’t walk for 4 days after the class, and I loved it!!! The studio is fun, kitschy, and reminds me of my 6 years in the 305. I’m not lying when I say 305 Fitness is one of the toughest classes I’ve ever tried, but one of the most fun. I can’t wait to go back and let off some steam from all the managerial statistics and corporate finance stuff swirling in my brain. I think the best and most rewarding part about the class, its a safe space to be free, have fun, and embrace your inner Sasha Fierce. If you want to check out 305 Fitness follow the link here. Hopefully I see you in class, and leave a comment with any NYC boutique workout recommendations you have…or some classes you’d like me to review for you!